Ever since the arrival of the Arabs to Kerala, the region came to be called Malabar, a word believed to be an Arabic formation. Several historians attempted to determine the earliest use of the word ‘Malabar,’ used to demarcate the Kerala region. There is unanimity in the opinion that this term appears first in the geography of Edrisi (c.1150). The term ‘Malabar’ was first used by foreign writers to specify the western coast. Al Biruni (AD 970-1039) appears to have been the first to call the country by the name ‘Malabar’. The Egyptian merchant Cosmos Indicopleustes (6th century AD) mentions a town Male (a mountain region) on the West Coast of India, as a great emporium of pepper trade. Under Justinian, Cosmas, in the course of his traffic, made some voyages to India, whence he acquired the surname of Indicopleustes. He observed that "in the country which is called Male (Malabar), where pepper is growing, there is a bishop Ordained in Perdia.” The new American cyclopaedia considers Malabar Coast as an “indefinite term applied to the whole W. side of the Indian peninsula. In a somewhat more restricted sense it means the coasts of Concan, Canara, Malabar proper, Cochin, and Travancore.” Captain Amasa Delano explains the term Malabar to have the same meaning with the word mountaineer, and to refer to the mountains of Hindostan, from which the people of the coast came. The Portuguese, on their arrival in India, found the term Malabar in greater use, wherein the prefix mala has attained the meaning of a mountain. Difficulty has been felt to ascertain the origin and meaning of the affix bar. Lassen considers it “as identical with the Sanskrit vara, in the sense of ‘a region’; Malaya vara = Malabar = the region of Malaya, the Western Ghats. As the Malaya-vaara is a factitious word, not really found in Sanskrit, and never actually used by the people of the Malabar Coast, this argument failed to get acceptance. “The same difficulty stands in the way of Mala vaaram, Tamil- Mal., the foot of the mountains, and Malappadu, the mountain district. These derivations might be regarded at first sight as admissible; but they are Indian vernacular words, and if the name ‘Malabar’ had been derived from them, we should expect to find them in use in India itself, whereas there is no trace of either of them having ever actually been used by any Indian people.” Bar, in the Persian language, signifies country, as Zengebar, the country of the Zenges. In that sense, Mali-bar is believed to be the country of the Malays. Malabar is explained as an Arabic corruption from mala (vernacular) for mountain. But long before the time of Cosmos Indicoplaestus (AD 522-547) down to the 11th or 12th century, the word ‘Male’ was applied to the coast by foreigners. Probably, in part at least the word Malabar is of foreign origin. The first two syllables are almost certainly the ordinary Dravidian word male (hill, mountain) and bar is probably the Arabic word ‘barr’ (country). Malabar may therefore be taken to mean the hilly or mountainous country, a name well suited to its physical characteristics. The original Indian appellation is Malayalim, or the hilly country; or, according to others, is Maliabar, a name given to it by Persians, and signifying the country of the Malays, when they the natives of the coast of India confronted. Amasa Delano considers the term Malabar supposed to have the same meaning with the word mountaineer. He thinks that this word refers to the mountains of Hindostan, from which the people of the coast came. Sabda Tharaavali of Sreekandewaram names Malabar as an old word and calls it Malamandalam. Today Malabar is considered as a word indicating the hilly region of Kerala and is called Mala(yala)nadu. As everyone seems to be satisfied with the meaning that the word assumed, no one is bothered to discuss it afresh. But the feeling that the original meaning is still evading has made it necessary to renew the discussion. The Arabs came to Kerala not as tourists. They came for spices trade. As such, we shall begin with describing the importance of spices in the old world. Pepper, an important culinary spice from ancient times, was used to cover the taste of spoiled food and the Europeans craved spices to preserve meat. Salting was the only form of food preservation for centuries which made salted meat palatable. Increase of pepper’s high value, made its demand almost insatiable, although the advent of refrigeration has lessened the need for salt-curing foods. Peppercorn on reaching Western Europe from Malabar began to be used in a variety of ways, as it attained almost on its own right the status of a currency. The black pepper in Europe, during the Middle Ages and Tudor times, was highly priced and so expensive. This made South Arabia the great spice emporium of the ancient world. The Malabar Coast furnishes an example of an Indian trading area, where peddlers were not particularly prominent, making this region so important in the pepper trade from Asia to Europe. Spices such as cinnamon, ginger, cloves, pepper and nutmeg had travelled overland for millennia to the West. Though these names are as old as the language itself, ignorance about its sources prevailed for a period. The traditional overland routes helped the horde of middlemen along the way. The slow transportation of spices took trading advantage from pushing up the price. It is said that all the pepper available to world trade at the time came from Malabar. The world realized India and the Far East as the epic centers of the spices trade, only with the advent of seafaring exploration in the medieval times. The desire to enrich them engaging in the hugely profitable spices trade ignited many a European to navigate to India. The young Italian sailor Columbus set sail due west, in search of a shorter route to the treasures of the orient, that would not mean travelling round the Cape of Good Hope. A desire for a share in the highly lucrative spice trade played an important part in inspiring the exploration. Queen Isabella of Spain wanted to make her country rich. She sponsored Columbus’s plan and raised money to meet his voyage expenses to what turned out to be a new world. This voyage of discovery is annually remembered when people celebrate the discovery day on every Oct. 12. In the centuries that followed, the traders from the west, in successive waves, bribed, negotiated, and fought their way eastwards, in search of the source of these riches. This found the displacement of the Indians, hitherto the most important merchants in the region. Milburn has demarcated the pepper countries as extending from about the longitude of 96° to that of 115° east longitude. This region reaches from 5° south latitude to about 12° north. Countries coming within these limits are Sumatra, Borneo, the Malayan peninsula, and certain countries lying on the east coast of the Gulf of Siam. Only few pepper vines are found and their cultivation ceases beyond these limits. The Moluccas (Maluku in Indonesian) are a group of islands of eastern Indonesia between Sulawesi and New Guinea. These fabled Spice Islands lie north and south of the Equator, from the Philippines in the north to Papua in the east and the Lesser Sunda Islands in the southeast. Halmahera, Ceram, and Buru are its three large islands. Situated at the point where the wind systems of the Indian Ocean and China Sea meet, Malacca provided a natural harbor better and safer than Singapore, whose produce was in demand everywhere. This geographical position enhanced Malacca’s virtues as a commercial center. Tome Pires, an accountant in the Portuguese factory from 1512 to 1515, summarized the entrepot's commercial significance. He stated bluntly: “Whoever is lord of Malacca, has his hand on the throat of Venice.” A major port along the spice-route, Malacca harbor bristled with the sails and masts of Chinese junks and spice-laden vessels from all over the hemisphere. Yet the Moluccas have been known to the outside world for longer than anywhere else in Indonesia. Part of the Asian spice trade with European merchants and colonists in the sixteenth to eighteenth centuries, Moluccas were the chief emporium of oriental commerce before Europeans visited the Indian seas. Pasai was the foremost port of North Sumatra, whose ports were exporting centers for pepper. The black pepper was the only plant cultivated at that time to any extent and its export made Malacca the great emporium. Modern Malaysia’s peninsular port of Malaca was fondly known to foreign traders as “The emporium of the East,” variously called as Malaka, Melaka, Malac(c)a and Maluku. Formerly the route of this spice trade was Maluku — East-Java — India. The Arabs in the fifteenth century brought Islam to Malacca and the neighborhood areas. The tieo-bo of the Cochin-Chinese, the Piper nigrum, is the Melago-codi of the Hortus Malabaricus. Cultivated in various parts of the East, as in Java, Sumatra, Borneo, and the Phillippine Isles, it grows in the greatest abundance in the province of Malabar, constituting one of the principal articles of export. Indigenous to the rain forests of Kerala in southwestern India, black pepper, kurumulaku (Ipcp)apfIv) in Malayalam, and maricham (acoNw) in Sanskrit, is the chief production of Malabar. Ubhayam (D`bw) means paddy fields as well as produce of trees. Naalubhayam (mep`bw) means four products. It is applied to the garden produce from North Malabar and refers to the produce from the usufruct trees such as coconut trees, arecanut trees, jack trees and pepper vines. It also used to denote a quartet. 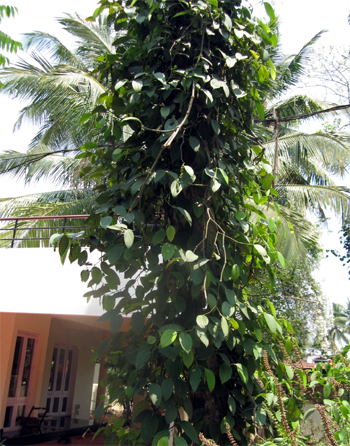 Fifth in degree of importance is the kodi, the betel vine. Periplus names twenty ports on the west coast of India. Pliny (the Elder) refers to Muziris, the most important port in ancient, India as the first market commercial station of India/ Primum Emporium Indiae. Tiruvanchikulum near Cranganur in the vicinity of the port of Muziris was the capital of the Perumals. The works of Sangam poets extolled Muziris as enjoying great prosperity in the days of Roman trade. Muziris is Muchiri/ Muciris in Tamil works and Murachipattanam in Valmiki Ramayana. The Jewish Copper Plate of Bhaskara Ravi Varma (1000 AD) mentions it as Muviri / Muriyikode. Muziris was called Makotai, Mahodayapuram and Mahodayapattanam. Murachi is Alwaye puzha, otherwise called Periyaaru. A cutcherry (kachahri in Urdu), revenue office in old Travancore, is called mulaku madissila /pandakassala. Ramayyan, the Dalawa of Travancore, was designated as the ‘Supervisor of matters relating to Pepper', called Mulaku Karyam Vicharippu. These administrative titles show the prominence of pepper in the affairs of the State. Even the country name is fashioned with the name of the spice. Kurunadu, a place name in Kerala lying between Murinjapuzha and Varappuzha, was famous for pepper in ancient Kerala. The prefix kuru refers to black pepper. Likewise, the place name Malacca rhymes with melagu and most likely with the words mu(i)laku on whose trade the Arabs sailed to the far east. Vyaapaaram is business, trade and commerce. Goods bought or sold is vyaapaaracharack. Could’nt the toponym Malabar, coined after the Malayalam word mulakuvyaapaaram which means pepper trade. Perhaps Malabar is a shortened form of the word mulakuvyaapaaram. These two names, Malabar and Malacca, integrate the quest of the Arabs for black pepper. While Malacca sounds like Malabar, milaku transmits a meaning close to its geography and the truth lies in the explorers of the distant past who frequented the Kerala coast in search of black pepper. It is said that the Moors of Mecca discovered India, and came to the province of Malabar, on account of the pepper which is found there. — Barbosa, 102. 1553. But today we are gradually rediscovering Malabar. Isaac Taylor, Names and Their Histories: A Handbook of Historical Geography and Topographical Nomenclature, Edn.2, Rivingtons,1898, p.184. Adoor K. K. Ramachandran Nair, Kerala State Gazetteer, Vol.1, Gazetteer of India, 1986, p.7. Christopher Buck, Paradise and paradigm: key symbols in Persian Christianity and the Baháí? Faith, Vol.10 of Studies in the Bábí and Bahá'í religions, SUNY Press, 1999, p.71. George Ripley, The New American Cyclopaedia: A Popular Dictionary of General Knowledge, Vol.11, D. Appleton and company, 1861, p.92. Amasa Delano, A narrative of voyages and travels in the northern and southern hemispheres: comprising three voyages round the world together with a voyage of survey and discovery in the Pacific Ocean and oriental islandsIssue 43828 of Early American imprints, Edn.2, E.G. House for the author, 1818, p.221. Robert Caldwell, A comparative grammar of the Dravidian or South-Indian family of languages, Edn.3, Asian Educational Services, 1998, p.23. East India Company, The Asiatic journal and monthly miscellany, Vol. 2, Wm. H. Allen & Co., 1816, p. 340. M. T. Narayanan, Agrarian relations in late medieval Malabar, Northern Book Centre, 2003, p.xvi. David Brewster (Editor), The Edinburgh encyclopaedia, 1830, p.286. Amasa Delano, A narrative of voyages and travels in the northern and southern hemispheres: comprising three voyages round the world together with a voyage of survey and discovery in the Pacific Ocean and oriental islands Issue 43828 of Early American imprints, Edn. 2, Printed by E.G. House for the author, 1818, p.221. Journal of Indian history, Vols. 31-32, Dept. of Modern Indian History, University of Kerala, 1954; B. J. Chacko, Sardar K.M. Panikkar: Shashtyabdapoorthy souvenir, Mathrubhumi Press, 1954, p.142. Chris Caldicott, Carolyn Caldicott, The spice routes, frances lincoln ltd, 2004, p.11. Andrew Dalby, Empire of pleasures: luxury and indulgence in the Roman world, Routledge, 2000, p.195. Quoted in Andrew Dalby, Dangerous Tastes: The Story of Spices, Issue 1 of California Studies in Food and Culture, University of California Press, 2002, p.93. Waverley Root, Food: an authoritative and visual history and dictionary of the foods of the world, Konecky & Konecky, 1980, p.338; also see Forum for Contemporary History, Skeptic, Issues 1-10, Skeptic Magazine, 1974, p.51. Asiatic Society of Bengal, Journal of the Asiatic Society of Bengal, Vol.20, Bishop's College Press, 1852, p.378. Great Britain. Supreme Court of Judicature, Great Britain. Parliament. House of Lords, Great Britain. Privy Council, The Weekly reporter, Vol. 43, Wildy & sons, 1895, p.4 and 645. E. A. Weiss, Spice crops, Cabi Publishing Series, 2002, p.155. Quoted in Maestro Martino, Luigi Ballerini, Stefania Barzini, The art of cooking: the first modern cookery book,Vol.14 of California studies in food and culture, University of California Press, 2005, p.46. Waverley Root, Food: an authoritative and visual history and dictionary of the foods of the world, p.338. The New book of knowledge, Grolier, 1986. John Stephenson, James Morss Churchill, Medical botany, or, Illustrations and descriptions of the medicinal plants of the London, Edinburgh, and Dublin pharmacopœias: comprising a popular and scientific account of all those poisonous vegetables that are indigenous to Great Britain, Vol.4, J. Churchill, 1831. Malaysia Country Study Guide, World Strategic and Business Information Library, Edn. 6, International Business Publications, 2007, p.65. Tome Piers, in Armando Cortesao (ed. ), The Suma Oriental of Tomi Piers, 1944, written 1512-15. Marshall Cavendish Corporation, World and Its Peoples: Indonesia and East Timor, Vol.10: Eastern and Southern Asia, 2007, p.1309. The Gardens' bulletin, Singapore, Govt. Print. Off., 1905, p.295. Holly S. Smith, Adventuring in Indonesia: exploring the natural areas of the Pacific's ring of fire, The Sierra Club adventure travel guides, Adventure Travel Guides, A Sierra club traveling guide, Sierra Club Books, 1997, p.20. Thomas Suárez, Early mapping of Southeast Asia, Tuttle Publishing, 1999, p.104. E. A. Weiss, Spice crops, Cabi Publishing Series, Cabi Series, Cabi, 2002, p.155. Hort. Mal. Vii.p.23, t 12. Gilbert Thomas Burnett, Outlines of botany: including a general history of the vegetable kingdom, in which plants are arranged according to the system of natural affinities, Vol. 2, John Churchill, 1835, p.581. K. M. Nadkarni Dr. K.M. Nadkarni's Indian Materia Medica., Vol 2 Edn. 3, Popular Prakashan, 1996 , p.969. Hamdard National Foundation, Pakistan, Hamdard Islamicus: quarterly journal of the Hamdard National Foundation, Pakistan, Vol. 7, The Foundation, 1984, p.95. S. S. Shashi, Encyclopaedia Indica: India, Pakistan, Bangladesh, Vol.100, Anmol Publications,1996,p.139; Adoor K. K. Ramachandran Nair, Kerala State Gazetteer: Vol.1, 1986; Krishnat P. Padmanabha Menon, Jacobus Carter Visscher, History of Kerala: A history of Kerala, written in the form of notes on Visscher's Letters from Malabar, and, Vol.1, Printed at the Cochin Govt. Press, 1924, p.45. Letters from Malabar, tr. : to which is added An account of Travancore, and fra Bartolomeo's travels in that country. By H. Drury, Translated by Heber Drury, 1862 , p.153, also Krishnat P. Padmanabha Menon, History of Kerala: A History of Kerala Written in the Form of Notes on Visscher's Letters from Malabar, Vol.4, Asian Educational Services, 1986, p. xxvi. Arthur William Alsager Pollock, The United service magazine, Vol.139, p.3, H. Colburn, 1875, p.442. Sir Henry Yule, Arthur Coke Burnell, William Crooke, Hobson-Jobson: a glossary of colloquial Anglo-Indian words and phrases, and of kindred terms, etymological, historical, geographical and discursive,Edn.2, Routledge & Kegan Paul, 1968, p. 540.